How Should I Consume Weed for the First Time? For those in the early stages of incorporating cannabis as a part of your lifestyle, it can often feel overwhelming to consider the various options for consumption. From cannabis-based edibles and topicals to smoking and vaping, there are many different ways to ingest the herb. However, the cannabis product recommendations for first-time consumers have increasingly leaned towards vaping or edibles. If it’s your first time-consuming weed, tips often encourage you to keep it simple and to avoid overcomplicating the process to make the learning curve a bit less steep. This will enable you to maximize the benefits of cannabis without requiring you to struggle through a more complicated consumption process, such as rolling a joint, allowing you to simply enjoy experiencing the herb. For those wondering, “How should I consume weed for the first time?”, vaping is often a clear front- runner for many different reasons. If you’re not a smoker nor interested in smoking, edibles are an excellent way to consume cannabis as well. Recent studies have shown that many cannabis consumers prefer vaping weed extract through a vape pen over smoking a joint, attributing it to a higher-quality flavor, the distinct lack of a lingering smoke smell, and stronger effects. Low dose edibles are a good way to consume cannabis without the “marijuana” taste. Also, this way to consume cannabis also means no marijuana smells. Unlike smoking, vaping allows the user to inhale the vapor in small, short puffs instead of deep breaths. For many consumers, particularly those who are just getting started with cannabis, vaping is a far easier method. Edibles are another user-friendly way to consume marijuana, as there is no need to master the use of a vape pen. Gummies, for example, are small, tasty, and easy to consume. With the growing popularity of vaporizers and e-cigarettes, utilizing the devices for vaping weed has become a highly discreet way to consume cannabis – especially when compared to traditional smoking. Just like eating a piece of candy, gummies or hard candy style edibles are perfect for a quick bite with results kicking in within 25-45 minutes after consuming. If you are consuming an edible for the first time, be careful to watch your dose. It’s recommended to start with 2mg of THC and wait two hours before consuming any more THC. One of the most important steps you can take in your cannabis journey is to choose high-quality products that have been expertly crafted so you can enjoy them with confidence. Instead of starting your cannabis journey with products you’ll find lacking in quality, effectiveness, and user-friendliness, enjoy a confident experience with premium-quality products from a company you can trust, such as Darwin. If you plan to try vaping weed, a distillate cartridge system like Darwin’s Origin Series is an ideal set-up for your first vape and beyond. 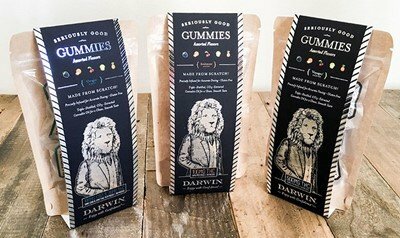 If you’re interested in going the edibles route for consuming marijuana for the first time, take a look at Darwin’s Origin Series’ Seriously Good Gummies. To learn more about how you should consume weed for the first time, and products that can provide you with an enjoyable, confident experience, visit www.darwinbrands.com or ask about Darwin products in your local dispensary. https://darwinbrands.com/wp-content/uploads/2018/04/DARWIN-webheaderlogo-340x156-black-300x138.png 0 0 darwinbrands https://darwinbrands.com/wp-content/uploads/2018/04/DARWIN-webheaderlogo-340x156-black-300x138.png darwinbrands2019-04-11 13:25:272019-04-11 13:25:27How Should I Consume Weed for the First Time?